Los Angeles Airport Scenery v3, California (CA). 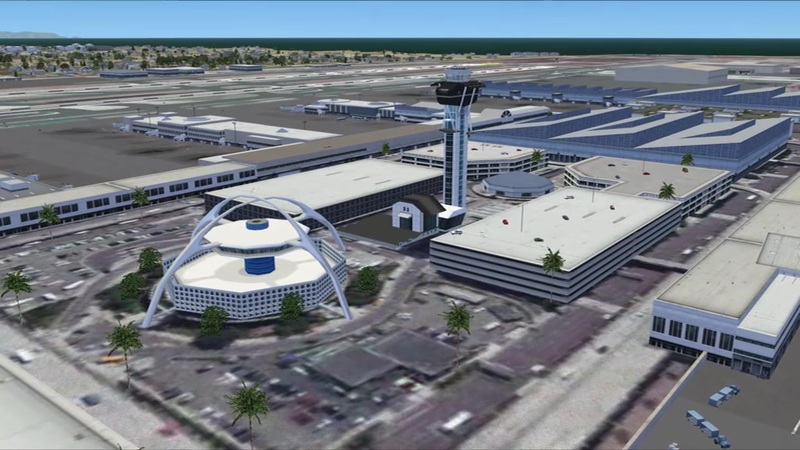 This photoreal scenery is a complete rebuild for the default KLAX airport using the latest version of ADE, Google SkecthUp 8, and SBuilderX scenery design tool. This new KLAX scenery includes new terminal buildings that have been resized and redesigned to look more realistic. Includes terminal lights, (no night light lamps yet), new trees, cars to the parking garages, ground vehicles taxiway usage fixed, and several other nice details to enhance the KLAX experience. Other details included are the New Tom Bradley International Terminal, buildings located on W. Cenury Blvd, nine Airbus A380 parking spots, and photoreal ground textures. The runways and airport aprons are aligned to match Google and Yahoo satellite imagery. By Glenn Johnson. Screenshot of Los Angeles Airport. 1. Start FSX and Deactivate and/or delete the "KLAX_PHOTO_REAL" Scenery in the Settings, Scenery Library menu tab. 1. Copy the KLAX Photo_Real_V3.0 Folder and Paste it into your: Microsoft Flight Simulator X/Addon Scenery folder. 2. Start FSX and activate the KLAX Photo_Real_V3.0 scenery in the settings, scenery library tab. 1. Deactivate and/or delete the KLAX Photo_Real_V3.0 in the settings, scenery library tab. 1. Open the folder named "RWYs 07_06 Closed" and copy the AFCAD file named KLAX_ADEX_GJ_CL.bgl. 2. Paste this KLAX_ADEX_GJ_CL.bgl into your; Microsoft Flight Simulator X/Addon Scenery/KLAX Photo_Real_V3.0/Scenery folder. 3. Delete the KLAX_ADEX_GJ.bgl file. The archive klax_pr_v3.zip has 45 files and directories contained within it.